Socks. It's like the laziest Christmas present around. Sure everyone needs socks, but no matter how pragmatic the thinking behind offering them as a gift, could you really find Anything. More. Boring? Unless, of course, they are socks made from cutting edge technology. 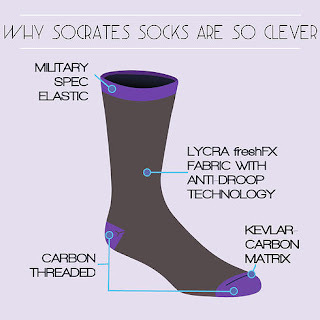 Socrates socks are purported to be virtually indestructible because they get a boost from a number of fancy materials including kevlar, carbon, lycra and military-grade elastic. Why? To reinforce the toe and heel and prevent holes, and to hold them up nice and high on your calf throughout their entire lifespan. Not surprisingly, these socks were originally a Kickstarter project (seriously, I don't live my life on that site, I found these on The Awesomer). It was a fantastically successful Kickstarter project, raising almost $100K in a month. 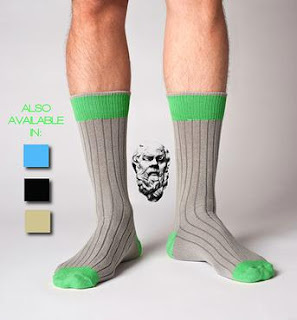 Now you can buy them off the SocSock website in 2-packs for $30 (which considering that they'll never need replacement, isn't that bad). And they come in some pretty nifty designs. As awesome as they are though, let's do a little what-if scenario: So it's Christmas morning, and your giftee opens the box and sees socks. Let's be honest you need to prepare yourself for either disappointment or puzzlement. You're going to have to explain why these are the only socks they will ever need from now on, and how they are now holding in their hot little hand the latest that science and technology has to offer. And then be prepared for... possibly amazement, but probably still a shrug. I mean, this is an impressive piece of clothing technology, but I truly think that only a true nerd will really appreciate just how special these are.